How to Backup your Data with Myki. 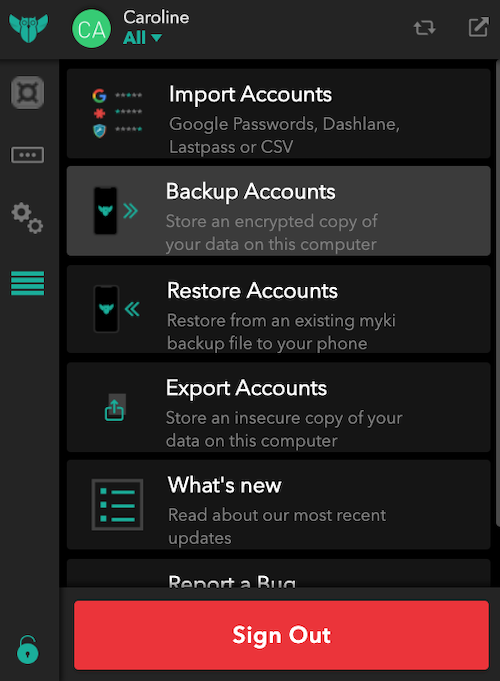 By default, Myki automatically creates up-to-date backup files of your data on your computer. In addition to automatic backups Myki offers the ability to manually create backups. Select "Backup Accounts". You will receive a notification on your smartphone which will prompt you to scan the QR code. Scan the code! A backup file will then be downloaded to your "Downloads" folder. Make sure to keep those backup files somewhere safe as you never know when you might need them to restore your data!